It’ about a threat of flooding earlier this month, the county says. Benton County officials are as considerate as anyone in making sure that minorities are not left out. Still I was surprised to come across a county press release in Arabic. The announcement came out on Dec. 17, and it warned of possible flooding along the Marys River. There was the standard version in English. Then there was one in Spanish. The only other version was in something other than Latin lettering, which meant I could not even sound it out. And, as I said, Arabic it was. How come? I asked Rick Osborne, the county’s public information officer, who wrote the English version and put all three versions online. 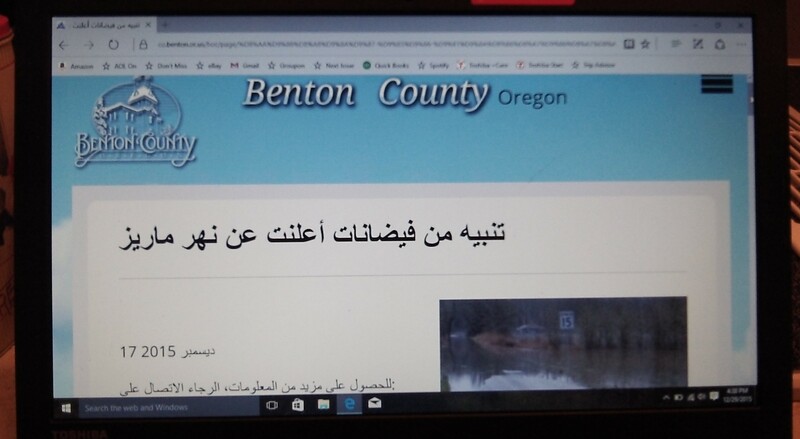 An employee in the county health department knows Arabic and was able to translate Osborne’s flood warning in short order. Osborne thinks Arabic is the fastest-growing language group in the county, and he believes it has something to do with Oregon State University. But if there has been an influx, the Census Bureau’s community survey for 2014 did not yet reflect it. In a population of 82,342 people 5 years of age and older, the survey estimated there were only about 850 who spoke a category of languages which the published information implied included Arabic. And of those, only about 300 spoke English less than well. The community survey has other interesting facts about the demographics of Benton County. For instance, of a total population estimated at 86,000, 724 or 0.8 percent were said to be of Arabic ancestry. German ancestry was attributed to just under 16,000 or 18.5 percent, the largest group, followed by English with 12.2 percent and Irish with 11.7 percent. Many other nationalities also are listed in the ancestry department, including Italian and Swedish.